Connect your iPhone 4 with your PC, laptop or MAC. iPhone Dock. Audio out connect to Hi-Fi. Allows you to transfer pictures, music and files. Product Specifications. Product Features. It is thenArgos' responsibility to inform you once your parcel has arrived and is ready for collection. Compatible with iPhone 4S 4 3GS 3G. Connect the dock to a stereo or speakers using a stereo cable, or headphones. Dock is simple to use, simply plug the USB cable. Colour: White. High quality cable. For iPhone 8, iPhone 8 Plus, iPhone 7, iPhone 7 Plus, iPhone 6, iPhone 6s. iPhone 5s, iPhone 5c, iPhone 5. 1x iPhone 4 to iPhone 5 6 Converter Adapter Adaptor. High quality 8 pin to 30 pin Adapter. Allows you to use your old 30 pin accessories to devices featuring the 8 pin. IPhone 4S Black Dock Connector. IPhone Series : iPhone 3G, iPhone 3GS, iPhone 4, iPhone 4S, iPhone 5, iPhone 5S, iPhone 5C, iPhone 6, iPhone 6S, iPhone 6 Plus, iPhone 6S Plus. Designed so that you can use your old speaker audio dock and connect to the new iPhone lightning connection. Lightning to 30 Pin Converter Dock Adapter Connector For iPhone 4 to 5 6 Charger. WE PRIDE OUR SELF ON MAKING THE ORDER PROCESS AS SIMPLE POSSIBLE. WE WORK WITH ALL THE LEADING MANUFACTURERS AND DISTRIBUTORS TO ENSURE WE BRING YOU THE BEST AND LATEST PRODUCTS. DHAMMATEK STARTED IN 2006 AND BASED IN PETERBOROUGH, CAMBRIDGESHIRE. This adapter lets you connect devices with a Lightning connector to many of your 30-pin accessories. 30 Pin to 8 pin lighting adapter for iPhone 7, 7 , 6, 6 , 5, 5S, 5C, ipad Mini, ipod Nano - White. Convert your old apple 30 pin accessories to the newer 8pin lightning connector. 30pin converter cable to micro connector. Galaxy Note 1. Galaxy Note 2. Galaxy Note 3. 30 pin iPhone or iPad connector to. Etc. and many more anything else that uses micro usb cable connector. Galaxy Tab 3. This cable adds an extension to your existing iPhone 4 or older ipad device. It requires the original cable which fits into the extension port so that its length is increased by 1m. It lets you connect your new micro USB Android devices to many of your 30-pin female devices and audio docking station. This lead does not work with Apple iPhone. Most tablets / Android Smartphones / Micro USB V2.0. This fits only iPhone 4 or 4G. Do you want to view movies, photos, slides and everything else that fills your iPhone/iPad/iPod screen on HDTV or Projector via HDMI port ?. Then REALMAX® iPad to HDMI TV cable is the answer. Not every iPad to HDMI TV Cable has the technology and construction required for crisp Video without digital jitter and loss of audio video clarity. 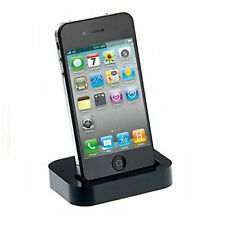 Desktop Sync Charger Dock Docking Station For Apple iPhone 4 4G 4S, iPod & More. Iwantit Speaker Dock For IPhone 4s. Condition is Used. There are two marks on the front of the dock see photo, the dock is in good working order and comes with plug, no instructions. Dispatched with Royal Mail 2nd Class.